The Smithsonian's National Zoo will welcome three female Asian elephants –Kamala, Swarna and Maharani– next spring, expanding the Zoo's existing herd to seven. They will be on loan from the Calgary Zoo in Calgary, Alberta, Canada, which announced in April 2012 that it would relocate its elephants based on their long-term welfare needs. Kamala and Swarna were born in the wild around 1975 and came to the Calgary Zoo from the Pinnawala Elephant Orphanage in Sri Lanka in May 1976. Maharani, Kamala's female offspring, was born at the Calgary Zoo July 14, 1990. At the National Zoo's Elephant Trails complex, they will have four companions: females Ambika (65), Bozie (37) and Shanthi (38) and Shanthi's 11-year-old male offspring, Kandula. Records indicate that Kamala, Swarna, Bozie and Shanthi overlapped at the orphanage before departing for new homes in North America. 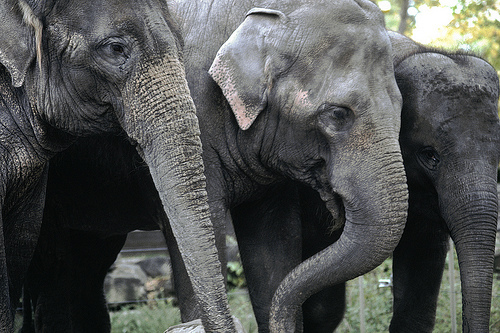 Philanthropist David M. Rubenstein contributed $2 million, enabling the National Zoo to bring the elephants to Washington. The funds will cover the costs of elephant transportation, elephant keepers' travel and training, health care and veterinary assessments, facility upgrades and in situ conservation. This is Rubenstein's second major gift to the National Zoo. In December 2011, Rubenstein gave $4.5 million to fund the Zoo's comprehensive giant panda conservation program through 2016. That gift supports conservation work in China, reproductive science, professional training programs, giant panda husbandry at the Zoo and public education programs. Rubenstein, co-chief executive officer of The Carlyle Group, has been a member of the Smithsonian's Board of Regents since 2009. Kamala, Swarna and Maharani will be in quarantine in the elephant barn for a minimum of 30 days upon their arrival at the National Zoo, per standard procedure. An expert team of elephant keepers, nutritionists and veterinarians will care for them. To keep the elephants mentally and physically stimulated, keepers will provide them with a variety of enrichment, including bamboo, boomer balls and puzzle feeders. Following quarantine, Zoo staff will begin the process of introducing the new group to the Zoo's current herd. The National Zoo's Elephant Trails exhibit was designed in keeping with the best practices for Asian-elephant management. It includes space for socializing, training and playing while providing the elephant staff safe access to the animals. Altogether, the facility can house eight to 10 adult elephants and their young.